elow you will find a full list of Historic Monuments in Zambia from the National Heritage Council. Chifubwa Stream Cave 6.4 km from Solwezi at 12°13' S 26°25' E.
Gwisho Hot Springs, Lochinvar National Park, Monze: Late Stone Age human skeletons from about 4,000 years ago. Ing-ombe Ilede, Lusitu, is an archaeological site near the town of Siavonga, at 16°11' S 28°19' E.
Kalemba Rock Shelter, Chadiza District, with many rock paintings, at 14°7' S 32°30' E.
Kalundu Mound, Kalomo, site of a village from at least the ninth century until the twelfth century. Kasamba Stream Grinding Grooves, Samfya — Iron Age site 1.6 km south of boma where axes and iron implements were sharpened, at 11°20' S 29°33' E. On the western shore of Lake Bangweulu, just south of Samfya, is an outcrop of rock which bears a large number of artificial grinding grooves dating back possibly to the Iron Age. It is thought they were used for grinding and polishing axes. Kundabwika Rock Painting — near Kundabwika Falls, 96 km north-west of Mporokoso at 9°13' S 29°19' E.
Leopard's Hill Cave, Lusaka District. Libala Limestone, Lusaka next to Lusaka Primary School along Chilimbulu road. Pleistocene Hope Fountain Culture in Southern Africa, north side of town. 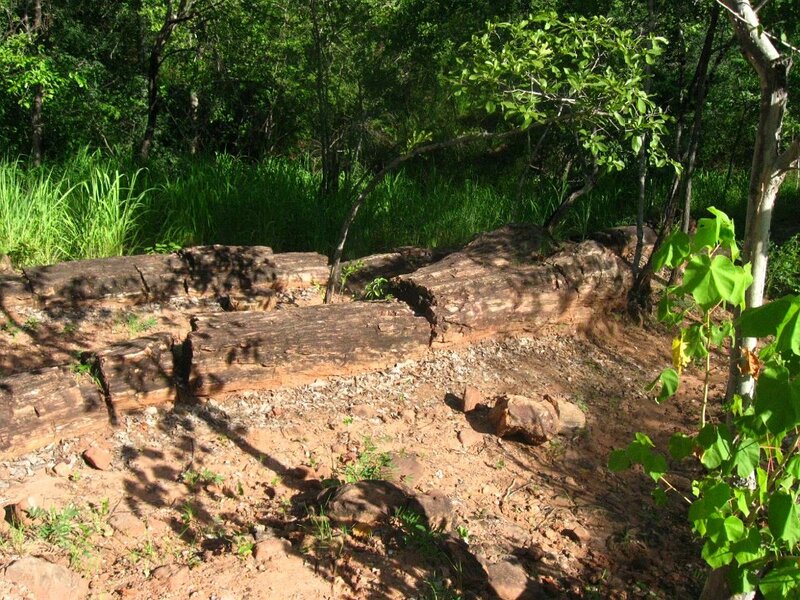 Mkomo Rock Shelter — Iron Age rock shelter and paintings, 64 km west of Chipata at 13°54' S 32°12' E.
Jikubi Ceremony. 14°59' S 27°02' E.
Munwa Stream Rock Engravings — in Mwense district at 20°29' S 28°40' E.
Mwela Rock Paintings, Kasama, 4.8 km from centre, north of the Kasama Isoka road at 10°10' S 31°13' E.
Nachikufu Cave, Mpika District — 18,000-year-old rock paintings in a cave at 12°15' S 31°10' E.
Nachitalo Hill, Mkushi District — rock art 55 km south of Ndola near Msofu mission at 13°32' S 28°59' E.
Nsalu Cave & Rock Painting, Serenje District — 12,000-year-old rock paintings 30 km north of Kanona at 12°40 ' S 30°45' E. This semi-circular cave, cut into Nsalu hills contains some of the best examples of Africa’s schematic rock paintings. It stretches about 20 metres wide, 20 metres deep and eight metres high. Excavations carried out in the 1940’s showed the site was first occupied by middle Stone Age people although the majority of remains discovered relate to the hunting people of the late Stone Age and date back from about 12000 years ago to 1000 AD. The significance of the schematic drawings at Nsalu remains a mystery. Some archaeologists believe they were connected with initiation ceremonies but research into the subject continues. It’s a short detour off the GNR. 30 kms north of Kanona turn left, travel a further fourteen kilometres, turn right. This road leads to the caves in rugged hilly country. Nyambwezu Rock Shelter, Mwinilunga District, at Nyambwezu Falls, with paintings similar to Chifubwa Stream Cave, probably about 3,000 years old, at 12°00' 25°10' E.
Rocklands Farm Rock Paintings 16.km SE of Chipata, two groups of rock paintings on the west side of Katotola Kopje. Sebanzi Hill, Lochinvar National Park, Monze: 2.7 km WSW of the ranch house, the site of a large Iron Age village, apparently occupied by the ancestors of the Tonga tribe from about A.D. 1100. 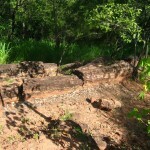 Twickenham Road Archaeological Site, Twickenham Road, Olympia Park, Lusaka. Twin Rivers Kopje, 24 km south-west of Lusaka. Victoria Falls Trust Area Archaeological Sites, Livingstone — 5.6 km west of town on north side of Sesheke Road, Early to Later Stone Age sites which are the key for determining the Stone Age cultural sequence in the Upper Zambezi Valley. Zawi Hill Rock Paintings, 32 km north of Chipata near Kamukwe Village. Administrator's House, Kalomo — capital of North-Western Rhodesia, up to 1911. Castle Hotel, Lundazi, built 1956. Livingstone Memorial, Mpika district — built in 1902 to mark the site where David Livingstone died in 1873. Fort Elwes — fort with stone walls on the Congo Pedicle border north of Mkushi. Fort Monze — 1890s, one of the earliest colonial police posts, 12 km SSW of Monze. Fort Young 21 km SSE of Chipata on the Nsadzu-Mpezeni road at 13°50' S 32°40' E.
Mpongwe Fortified Camp, Mpongwe, consisting of a raised bank and double ditch constructed during a period of raiding into the area by the neighbours of the Lima people, probably about 1870 at 13°31' S 28°9' E.
Niamkolo Church, Mpulungu — the oldest surviving church building in Zambia, dating from 1895, near Mpulungu on Lake Tanganyika. Nkala Old Boma — built in 1901 as a fortified police camp, at the top of Kapilika Nakalomwe Hill just outside Kafue National Park. Old Drift, Livingstone — the first colonial settlement dating from the 1890s, next to a good river crossing point; its cemetery is in the game park section of the Mosi-oa-Tunya National Park. Old Government House, Livingstone — the main government office and governor's residence 1907-1935 when Livingstone was the capital of North-Western Rhodesia and Northern Rhodesia. Tanganyika Victoria Memorial Institute, Mbala: Technical Institute built around 1905 in memory of Queen Victoria. "The Good News" Monument, Mbala District: commemorating the launching of the London Missionary Society's steamship, The Good News, in 1884. On the Lovu or Lufubu River 6.4 km upstream from Lake Tanganyika at 8°35' S 30°45' E.
Von Lettow-Vorbeck Memorial — located near the north end of Chambeshi Bridge at the spot where German East African forces agreed a cease-fire on 14 November 1918 marking the end of World War I.
Bwacha House Number E1376, Musuku Road, Bwacha Township, Kabwe, where on 8 March 1958 Dr K D Kuanda was elected President of the Zambia African National Congress. Chilenje House 394, Lusaka occupied by Dr K. D. Kaunda 1960-2. Former House of Rt Hon Prime Minister Robert Gabriel Mugabe of Zimbabwe at Chalimbana Teacher Training College, Lusaka. Freedom House, Freedom Way, Lusaka, from where the United National Independence Party (UNIP) manifesto of 1962 was launched. Kabompo House No. J11a Kabompo Township, Kabompo, to which Dr K. D. Kaunda was restricted by the Colonial authorities from March to July, 1959. Lubwa House of Dr Kenneth David Kaunda in Chinsali District at 10°35' S 32°1' E, occupied from 1945 by the first President of the Republic of Zambia while he was headmaster of Lubwa Upper Primary School. Matero House No. 3144, Monze Road, Matero Township, Lusaka. Old Chilenje House Number 280, Luwembu Street, Old Chilenje, Lusaka, the first office of the Zambia African National Congress. Big Tree, Kabwe: a fig tree with a 50 m wide canopy on the east side of Broadway, which served as a meeting place on many occasions during the early years of the township's history. Visible on Google Earth at 14°26'37.8 S 28°26'32.9E. The Big Tree National Monument cape fig tree is a prominent feature in downtown Kabwe, Zambia. Chichele Mofu Tree ? 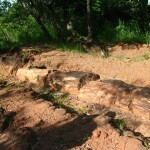 a large Mofu mahogany tree in Chichele National Forest 13 km west of Ndola. Dag Hammerskjold Memorial about 11 km west of Ndola at 12°58'32 S 28°31'13 E. This marks the spot, now in the Ndola West Forest Reserve where the aircraft carrying Dag Hammerskjold, author and former Secretary General of the United Nations, crashed on the 18th September 1961. To commemorate his death, a small cairn has been built in the centre of a simple memorial garden and a site museum has been opened to the public. Football Heroes Burial Site, Independence Stadium, Lusaka, where 30 victims of the 1993 Gabon Air Disaster are buried including the 18 members of the Zambia national football team. Ntembwe of Mwase Lundazi — an irregular earthwork bank and ditch which was a baKafula village until about 1850, in Lundazi at 12°24' S 33°22' E.
Old National Assembly, Lusaka: also known as the Old Secretariat and Legco, in Independence Avenue, Lusaka. Built 1932 and site of historic legislative events important to Zambia's history during colonial and post-independence times. Slave Tree, Ndola ? a large fig tree at Moffat Avenue and Livingstone Road, where slaves were bought and sold by Swahili slave traders. 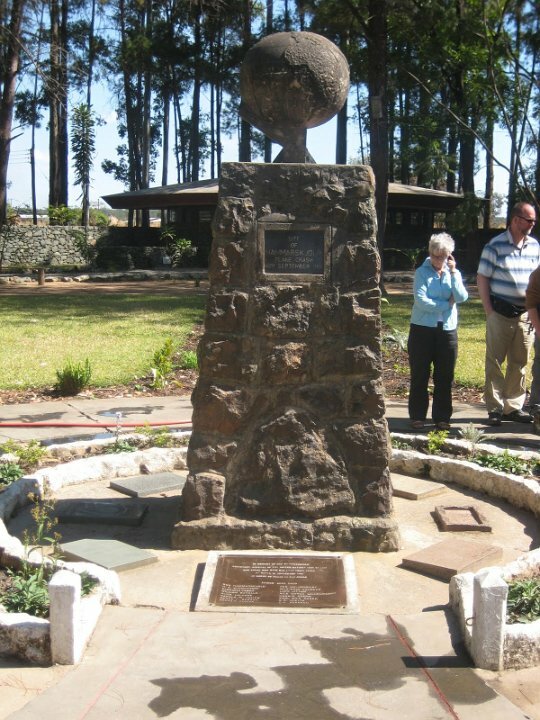 Collier Monument — to prospector William Collier’s 1902 discovery of copper ore at the Roan Antelope Mine in Luanshya. Lusaka Thermal Power Station, Great East Road, Lusaka. Moir And Bell Monument: Mufulira Copper Mines, where the prospectors, J. Moir and G. Bell, discovered copper-bearing ore in 1923. Railway Locomotive Sheds at Livingstone — c1920, now the site of the Livingstone Railway Museum. Lunsemfwa Wonder Gorge and Bell Point: Mkushi District at the confluence of the Lunsemfwa and Mkushi Rivers at 14°39' S 29°07' E. About 75 km east-southeast of Kabwe, Zambia, the Lunsemfwa River cuts a 500m deep gash, known as The Wonder Gorge, through the lip of the Muchinga Escarpment (viewed from Bell’s Point). The antenna atop the Taipei 101 skyscraper, the world’s tallest building, would just protrude above the rim of this gorge. Chipoma Falls on the Chimanabuwi River, 24 km SSW of Chinsali at 10°46' S 32°01' E.
Chirundu Fossil Forest — 50,000-year-old fossil trees, 21 km west of Chirundu at 16°02' S 28°40' E. Just off the main Lusaka - Chirundu road, not far from Chirundu, are fossil trees belonging to the Karoo period and are about 50,000 years old. The hills here are covered in what at first glance look like large cylindrical columns of rock. Chisimba Falls on the Luombe River 7.2 km from Chilubula Mission in Kasama District. Hippo Pool, Chingola on the Kafue River. Kalambo Falls, Mbala District — falls and archaeological site of early human habitation (the falls is shared with Tanzania. Kundalila Falls on the Kaombe River, 12.8 km SE of Kanona in Serenje District. Lake Chirengwa (Sunken Lake) 14 km E of Ndola at 12°58' S 28°45' E.
Lake Kashiba SW of Luanshya: a 100 m deep sunken lake at 13°27'S, 27°56'E. Zambezi Source, Mwinilunga District: source of the Zambezi River and a botanical reserve, part of Zambezi Source National Forest. These are not declared national monuments but are probably on the larger NHCC list of historic sites. It is an informal and incomplete list of sites — please let me know if there are others not mentioned here. Chilubula Mission, Kayembi — the first mission of the White Fathers in the territory built 1895 by Father Joseph Dupont, known as 'Moto Moto', it features a large church and well-preserved buildings. Otto Beit Bridge, Chirundu — 1939, first modern suspension bridge with parallel cables built outside the USA (shared with Zimbabwe). 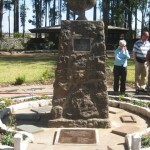 Broken Hill Mine, Kabwe — one of the first mines in Zambia (1906) and site of the Broken Hill Man fossil find commemorated by a memorial at the municipal offices. Kilwa Island, Lake Mweru — site of 19th Century slave traders’ stockade. Lwimbe Petroglyphs —about 15 km west of Kasama. 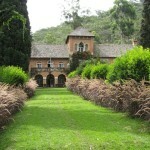 Girls Boarding School, Mbereshi — 1915, first African girls’ school in the country, now a mission house. 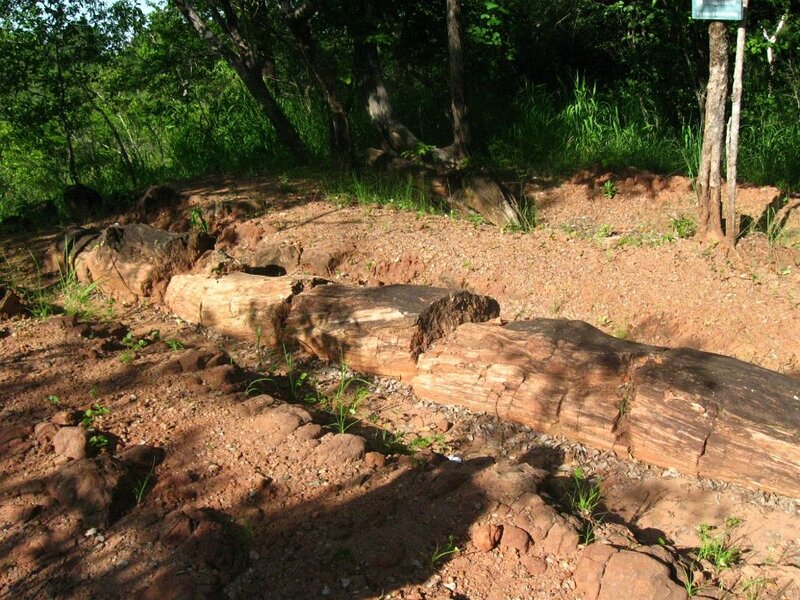 Mulungushi Rock, Kabwe — since 1960, site of independence movement conferences. Mumbwa, the first Copperbelt commercial copper mines in Zambia were the Sable Antelope mine and Hippo mine in Mumbwa, now heritage sites. North-Western Hotel, Livingstone — built 1909 by 'Mopane' Clarke. Saint Andrews Church, Livingstone — built 1910-11 in memory of David Livingstone and still in use. 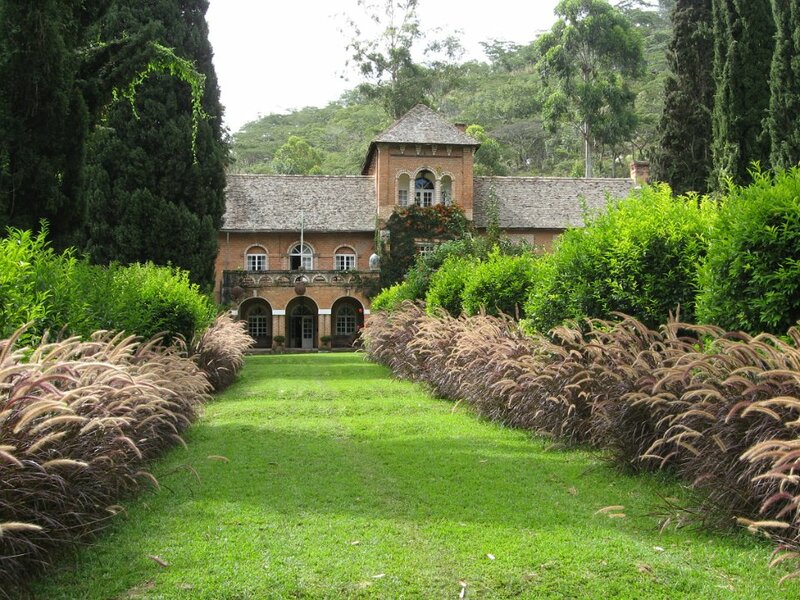 Shiwa House — 'manor house' built in 1922 by Sir Stewart Gore-Browne at his Shiwa Ngandu estate.